The Stock Exchange of Hong Kong (the Exchange) published two consultation papers on its connected transaction rules on 26 April 2013. The main consultation paper [archived copy] reviews the current model for regulating connected transactions conducted by Hong Kong listed issuers and sets out proposals to simplify the rules and deal with anomalies. The consultation paper is based on the outstanding issues in its 2009 consultation when the connected transaction rules were last amended. The Exchange believes that Hong Kong's regulatory approach to connected transactions is broadly appropriate and therefore the consultation does not propose a fundamental redesign. The second consultation paper reviews the differences in the definitions of "connected person" and "associate" in Chapter 1 and Chapter 14A (GEM Chapter 20). The Exchange proposes to align the definitions of "connected person" and "associate" in certain parts of the Listing Rules with those used in Chapter 14A, while revising the definitions in Chapter 1 to distinguish them from those in Chapter 14A. The proposals in the consultation papers aim to capture connected transactions that pose a real risk of potential abuse, while reducing unnecessary administrative burdens on issuers. Some of the proposals are the codification of the Exchange's usual practice of granting exemptions/waivers from the connected transaction rules under specific circumstances. The public can submit written comments on the consultation papers' proposals by completing the questionnaire for the main consultation paper [archived copy] and the questionnaire for the second consultation paper [archived copy] on or before 26 June 2013. Minor amendments to the requirements for continuing connected transactions. The Consultation Paper starts with a comparison of Hong Kong's regulatory approach to related party transactions with that of other jurisdictions. The overriding purpose of Hong Kong's connected transaction rules is to safeguard the interests of minority shareholders from substantial shareholders, directors or other persons who are able to abuse their dominant positions by directing the issuer to conduct abusive connected transactions. In markets such as the United Kingdom and the United States where issuers are generally widely held by investors, the risk of abuse by management is more common, while in markets such as Hong Kong, China, Singapore and Japan where issuers are predominantly controlled by a dominant shareholder, the key risk is the possible expropriation of minority shareholders by the dominant shareholders. In Hong Kong, about 75% of issuers have a dominant shareholder who owns 30% or more of interests in the issuer. There is also a high level of connected transactions which are conducted mainly between issuers and their major shareholder groups (representing about 75% of the connected transactions announced in 2011). Immediate disclosure by way of announcement - an issuer must announce a connected transaction as soon as practicable after its terms have been agreed. The announcement must contain sufficient details of the transaction and independent non-executive directors' (INEDs) views on the transaction. Prior shareholder approval - the connected transaction must be conditional on independent shareholder approval. The issuer must send a circular to its shareholders containing sufficient details of the transaction and the opinion of an independent board committee and an independent financial adviser on the terms of the transaction. Connected transactions must be disclosed in annual reports. Continuing connected transactions are further subject to an annual review requirement by INEDs and auditors. "Connected persons at the subsidiary level" - a director, former director, chief executive, or substantial shareholder of any subsidiary of the issuer, or an associate of any of them. Any non-wholly owned subsidiary of the issuer in which a connected person at the issuer level directly holds an interest of 10% or more (Connected Subsidiary) is also included in the definition of connected persons. In other jurisdictions (except Singapore), directors of an issuer's controlling shareholder/holding company, and persons connected with them, are defined as connected persons in respective connected transaction rules. However, the Exchange does not propose to extend the scope of connected persons to cover connected persons at the holding company level. The Exchange considers that the current regime already provides sufficient safeguard by covering directors at the holding company level who are also directors of the issuer, or associates of the issuer's other directors or dominant shareholder. It is less likely that an individual director of the holding company, acting alone, could exert undue influence on the issuer since the issuer's ultimate dominant shareholder will have the incentive and power to monitor the directors (other than himself or his associates) in the interests of all shareholders. Also, transactions between issuers and persons who are only directors of their holding companies (or parties connected with these directors) are not common in Hong Kong. Another reason cited by the Exchange is that there would be practical difficulty for issuers to comply with connected transaction requirements if directors of the controlling shareholders/holding companies are also covered by the scope of connected persons. The directors are not parties to the listing agreement and therefore are not governed by the Listing Rules. In 2011, of the 1,877 connected transactions announced, 248 transactions (13%) were conducted with persons connected only at the subsidiary level. Of the 248 transactions, 64% were transactions between a connected person at the subsidiary level and the issuer (or its other subsidiary) while 36% were transactions between connected persons at the subsidiary level and the subsidiary so connected. The Exchange is of the view that transactions with persons connected only at the subsidiary level are unlikely to be abusive as these transactions are ultimately subject to the oversight of the issuer's board of directors who are independent of the connected persons at the subsidiary level and whose interest is aligned with the minority shareholders. The connected persons are unlikely to have undue influence on the actions of the issuer or its transacting subsidiaries. This is particularly so for transactions between a connected person at the subsidiary level and the issuer (or its other subsidiary). Moreover, of the 36% transactions between connected persons at the subsidiary level and the subsidiary connected with them, 87% involved substantial shareholders of the subsidiary or their associates. The Exchange believes that these transactions arise commercially between joint venture partners with legitimate business arrangements negotiated at arm's length. Exemption for transactions with persons connected only at the subsidiary level from the independent shareholder approval requirement. Given that there is no conflict of interest between the issuer's board and its shareholders, approval of these transactions by the issuer's board (which includes INEDs) should provide sufficient safeguards against possible abuse by connected persons at the subsidiary level. The Exchange proposes that such transactions would be subject to the approval of the issuer's board members (including INEDs) who do not have a material interest in the transaction and would require disclosure to shareholders. Exemption for all transactions between the issuer group and persons connected only at the subsidiary level. This proposed exemption would not however apply to transactions between a subsidiary (or any subsidiary below it) and the person connected with that subsidiary. Below is a diagram illustrating the exemption proposed under paragraph (b) above. X is a substantial shareholder of Subsidiary A and a connected person at the subsidiary level. 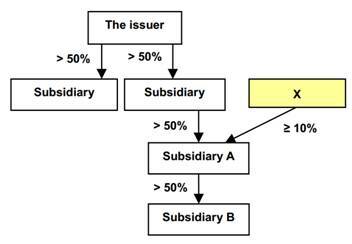 Under the proposed exemption, X would be treated as a connected person of the issuer only when it enters into transactions with Subsidiary A or B, given X's potential influence over these subsidiaries. The Exchange considers that the Listing Rules' current deeming provision is not adequate to cover certain circumstances where parties to the transactions have significant influence over the issuer (e.g. a de facto controlling shareholder or the holder of a substantial amount of convertible bonds of the issuer). A person who is accustomed to acting according to a connected person's directions or instructions (similar to the test for assessing public shareholders under Rule 8.24). In order to exclude persons who are unlikely to unduly influence an issuer from the definition of connected person so as to reduce the administrative burdens on issuers, the Exchange proposes the following exceptions to the definition of connected person. To exclude all persons connected only with an issuer's insignificant subsidiaries 1 from the definition of connected person. Since such persons are connected only through their relationship with insignificant subsidiaries, they have little influence over the issuer group. Currently, only transactions between the issuer group and persons connected with the issuer's insignificant subsidiaries are exempt (subject to a 10% restriction on the consideration test for any capital transaction between an insignificant and the person connected with that subsidiary). The Exchange proposes to exclude all persons connected only at the insignificant subsidiary level from the definition of connected person rather than exempting transactions conducted with such persons. The proposal would reduce the burden on issuers of having to maintain a list of persons connected at the insignificant subsidiary level. In addition, capital transactions with such persons that exceed 10% under the consideration test would no longer be connected transactions. To exclude any trustee of an employee share scheme or occupational pension scheme from the definition provided that the connected persons' interests in the scheme are less than 10%. Under the current rules, the definition of associate includes the trustees of a trust of which a director, chief executive or substantial shareholder (or if such person is a natural person, any of his immediate family) is a beneficiary. The proposed exemption represents a codification of the Exchange's practice of not treating the trustees of an employee share scheme or occupational pension scheme as the connected persons' associates if the scheme is established for a wide scope of participants and most of the participants are not connected persons. Clarify that the exemption for connected person holding an interest in an entity through the issuer (Note 1 to Rule 14A.11(4)) would apply if the connected person and his associate's direct interests in the entity (other than those held through the issuer) are together less than 10%. Under the Listing Rules, associates of a connected person include an entity in which a connected person has a 30% or more interest (directly or indirectly). Note 1 to Rule 14A.11(4) provides an exemption so that an entity is not treated as an associate if the connected person holds an interest in the entity only through his/its shareholding in the issuer. This is because the connected person's interest is the same as that of other shareholders of the issuer. However the Rule doesn't specify whether the exemption still applies if the connected person has a direct interest in the entity in addition to the indirect interest held through the issuer. The Exchange therefore proposes to modify Note 1 to the Rule to clarify that the exemption will still apply if the connected person and his associate's interests in the entity (other than those held through the issuer) are together less than 10%. The connected transaction rules cover both transactions between an issuer group and certain other transactions between the issuer group and third parties which may confer benefits on connected persons. They relate to investments in, or financing arrangements with, companies in which the issuer and its connected person(s) are, or will as a result of the transactions become shareholders. is of shares which are of a different class from those held by, or to be granted to, the controller or its associate (Listing Rule 14A.13(1)(b)(ii). Currently, the Listing Rule applies to controllers connected both at the issuer and subsidiary level. It is proposed that transactions with third parties involving target companies which are partly owned by controllers at the subsidiary level should be excluded. Rule 14A.13(b)(i) covers both acquisitions and disposals of an interest in a target company of which a controller is a substantial shareholder. The Exchange proposes to exclude issuers' disposals of interests from the rule since it is unlikely that such disposals would confer a benefit on the controller. The transactions covered by Rule 14A.13(b) include an issuer's transaction with a third party if the transaction involves the issuer (or its controller) acquiring an interest in a target company in specific circumstances The Exchange proposes to remove paragraphs (ii) to (iv) of Listing Rule 14A.13(1)(b) from the connected transaction requirements since the occurrence of these types of transactions is remote and any potential abuse could be addressed using the current deeming provision which deems a third party transacting with the issuer to be connected if he/it has entered, or proposes to enter, into any agreement or arrangement with a connected person with respect to his/its transaction with the issuer. The current rules governing financing arrangements between an issuer and a commonly held entity 2 should be retained. In practice, there are two types of agreements for CCTs. "Framework agreement" - this agreement sets out the framework within which a series of CCTs are to be conducted over a period. The actual terms of each transaction would be negotiated on a per transaction basis. Based on a sample of CCTs announced in 2011 and 2012, 37% of CCTs were governed by agreements with fixed terms while 63% were governed by framework agreements. The Exchange notes that in practice, while some issuers provide specific and sufficient details about the terms and conditions of the proposed CCT agreements, other issuers provide only general information about CCT agreements, in particular, in the case of framework agreements. The Exchange states that it is questionable whether the market practice of disclosure about framework agreements provides shareholders with sufficient information about the terms and conditions of the transactions, and particularly the pricing policy. The information is essential for shareholders to assess whether the CCTs will be on normal commercial terms and will not be prejudicial to the interests of the issuer and its minority shareholders. Without any specific proposals, the Exchange seeks market views on the current rules governing CCTs and the market practice in relation to CCTs conducted under framework agreements. The issuer must re-comply with the announcement and shareholder approval requirements if it proposes to renew the mandate or make a material change to the framework previously disclosed. While retaining the annual cap requirements for CCTs, the Exchange proposes to relax the rules such that the cap for CCTs of a revenue nature could be expressed in monetary terms or as a percentage of the issuer's annual revenue or other financial items in its published audited accounts. However, the proposed amendment does not apply to CCTs involving financial assistance that is not provided in the course of ordinary and usual business. Have exceeded the cap (if applicable). The confirmation is referred to as a limited assurance engagement in Practice Note 740 which is expressed in the form of negative assurance. It is not designed to obtain assurance that the CCTs are free from material misstatement. It may bring significant matters affecting the disclosed CCTs to the auditors' attention, but it does not provide all of the evidence that would be required in an audit. any amount payable or receivable by the issuer group. a confirmation from the INEDs and independent financial adviser that the transfer or non-exercise of option is fair and reasonable and in the interests of the issuer and its shareholders as a whole. Currently, the termination of an option involving a connected person is defined as a connected transaction. However, the Rules do not require it to be classified as if the option is exercised and do not specify how the size tests should be calculated. If the termination is made according to the terms of the original agreement and does not involve any payment of penalty, damages or other compensation, it is exempt from the connected transaction requirements. The Exchange considers that a termination is indistinguishable from the non-exercise of an option which is classified as if the option is exercised. It therefore proposes that the termination of any option should also be classified as if the option is exercised, unless the issuer has no discretion over the termination, for example if it is triggered by an event specified in the original agreement and is outside the control of the issuer. The alternative classification rules proposed for non-exercise of an option described under 5.1 above, if adopted, would also apply to the termination of options. The Exchange proposes to replace the current Chapter 14A with the Guide on Connected Transaction Rules [archived copy] so as to simplify the language of the rules and facilitate issuers' understating of and compliance with the rules. Whether the monetary limit of HK$10 million for connected transactions exempt from the shareholder approval requirement is appropriate. The Exchange proposes to codify its practice of granting an exemption from the connected transaction rules for issuers giving indemnities to, or purchasing/maintaining insurance for, a director against liabilities to third parties that may be incurred in the course of the director performing his duties which does not contravene any law of the issuer's place of incorporation. One of the conditions for the exemption of an issuer's provision or receipt of consumer goods or services to or from a connected person is that the total consideration or value of the goods or services must be less than 1% of the group's total revenue or total purchases, as published in the latest audited accounts. The Exchange proposes to remove the 1% cap on transaction value since the other conditions are considered stringent enough to avoid abuse of the exemption. Chapter 1 of the Listing Rules contains the general definitions of "connected person" and "associate" which are different from those used in Chapter 14A for the purpose of the connected transaction requirements. This is due to the different purposes served by Chapter 1 and Chapter 14A where, for the purpose of governing connected transactions, the definitions under Chapter 14A are necessarily broader in order to give stronger protection to independent/minority shareholders against dominant shareholders/directors. To simplify the language of the connected transaction rules, the Exchange proposes to include self-contained definitions of "connected person" and "associate" in Chapter 14A, while renaming the definitions in Chapter 1 as "restricted connected person" and "close associate" to distinguish them from those defined in Chapter 14A. In addition, the Exchange proposes a list of rules in parts other than Chapter 14A of the Listing Rules that should also adopt the definitions in Chapter 14A, and a list of rules that should continue to adopt the renamed definitions in Chapter 1("restricted connected person" and "close associate" under the Exchange's proposal). R14.06(b), R14.23B(2) Acquisition of assets from the issuer's incoming controlling shareholder or his/its associate under the reverse takeover Rule For any individual or company, the definition of associate in Chapter 14A is intended to cover those persons closely associated with the individual or company. The extended definition of associate under Chapter 14A includes an individual's family members and companies controlled by them. The reverse takeover rules should cover transactions with these extended associates given their relationship with the controlling shareholder. R14.58(3), R14.63(3) Issuer to disclose in the announcement and circular of a transaction that the counterparty and the ultimate beneficial owner of the counterparty are third parties independent of the issuer and its connected persons The issuer needs to ascertain whether the counterparty of a notifiable transaction and his/its beneficial owner are connected persons as defined in Chapter 14A to ensure compliance with the connected transaction requirements. These Rules currently apply to connected transactions. R7.21(2), R7.26A(1) Requirements for a rights issue or open offer underwritten by a director, chief executive or substantial shareholder of the issuer (or an associate of any of them) if there is no arrangement for excess applications For a connected person who is an individual, Chapter 14A extends the definition of associate to his family members and companies controlled by them. Rules 7.21(2) and 7.26A should also apply to any underwriting arrangements with the extended associates given their relationship with the director/chief executive/substantial shareholder. N1 to R13.36(2)(b), R19A.38 Any issue of securities by an issuer to a connected person under a general mandate is permitted only if it complies with Chapter 14A These Rules currently apply to connected transactions. R17.03(4) Shareholder approval requirement for granting share options to each participant and his associates which exceeds the limits set out in the Rule For a participant who is an individual, Chapter 14A extends the definition of associate to his family members and companies controlled by them. The requirements for granting options to the participant should also apply to any options granted to the extended associates given their relationship with the participant. Further, Chapter 14A exempts the grant of options to connected persons (including associates) under share option schemes that comply with Chapter 17. The scope of connected persons and associates under Chapters 14A and 17 should be the same. Chapter 14A exempts any on-market repurchase of shares from a connected person (except where the connected person knowingly sells the securities to the issuer). The scope of connected persons and associates under Rules 10.06(1) and (2) and Chapter 14A should be the same. For an individual, Chapter 14A extends the definition of associate to his family members and companies controlled by them. If the individual has a material interest in a transaction and needs to abstain from voting, the extended associates should also abstain from voting given their relationship with the individual. For any individual, Chapter 14A extends the definition of associate to an individual's family members and companies controlled by them. Where the Rules specifically require the controlling shareholder (or the directors and chief executive) to abstain from voting in certain types of transactions or corporate actions, the extended associates should also abstain from voting given their relationship with these connected persons. PN4 - Para 4(c) For a proposal to issue new warrants to existing warrant holders or to change the exercise period or exercise price of existing warrants, the Exchange has the right to require that any connected person of the issuer who holds more than 10% of the outstanding existing warrants to abstain from voting The definition of connected person under Chapter 14A is intended to catch those persons who can control or significantly influence the issuer. If any such person has a substantial holding in the outstanding warrants, the conflict of interest is obvious when the issuer proposes to issue new warrants to him/it or to change the major terms of the existing warrants held by him/it. R21.04(3)(d) (For investment companies only) Any custodian, management company, any of their connected persons, and every director of any investment company and management company, is prohibited from voting their own shares at, or being part of a quorum for, any meeting to the extent that they have or any of their associates has, a material interest in the business to be conducted Currently, the custodian and management company (and their connected persons), and the directors of the investment company and the management company are connected persons under Chapter 14A. For a connected person who is an individual, Chapter 14A extends the definition of associate to his family members and companies controlled by them. If the connected person is a shareholder of the issuer and any of his extended associate has a material interest in a transaction or matter, he should abstain from voting given his relationship with the extended associate. R13.44 A director of the issuer must not vote on any board resolution approving matters in which he or any of his associates has a material interest For a director, Chapter 14A extends the definition of associate to his family members and companies controlled by them. If any extended associate has a material interest in a transaction or matter to be considered at a board meeting, the director should not vote on the board resolution given his relationship with the extended associate. Note: If the proposed changes are adopted, an issuer needs not amend its constitutional document as a result of the changes to App3 provided that the issuer complies with the amended R13.44. App14 - Para B.1.2(h) The remuneration committee's terms of reference should include provision to ensure that no director or any of his associates is involved in deciding his own remuneration. R3.13 Factors to assess an INED's independence include any transactions, arrangements or relationships with the issuer's connected persons An INED/IFA/sponsor would need to take into account the extended definition of connected person under Chapter 14A when providing the confirmation of independence to the Exchange. The INED/IFA/sponsor should be able to demonstrate that he/it is independent of the connected persons under Chapter 14A as one of his/its duties is to review the issuer's connected transactions. Under these Rules, an IFA or sponsor also needs to consider its relationship with any associate of the issuer/new applicant. The definition of associate (for a company) in Chapters 1 and 14A is the same. As the IFA's role is to give an independent opinion on the connected transaction, it should demonstrate its independence from any persons closely related to the counterparty of the transaction as required under Chapter 14A. R3A.05 A new applicant and its directors to ensure its substantial shareholders and associates to assist the sponsor to perform its role For a substantial shareholder who is an individual, Chapter 14A extends the definition of associate to his family members and companies controlled by them. As one of the sponsor's duties is to review the new applicant's connected transactions, the substantial shareholders' extended associates should be able to assist the sponsor to perform its role. R7.16 For a listing by introduction, the issuer's application must include the holdings of the directors and their associates For a director, Chapter 14A extends the definition of associate to his family members and companies controlled by them. The disclosure requirements should also apply to the extended associates given their relationship with the director. Further, an issuer should have in place procedures to monitor whether the directors' associates (as defined in Chapter 14A) have any interests in the group's suppliers and customers to ensure compliance with the connected transaction Rules. In the case of an investment company, the definition of associate (for the management company, investment adviser or distribution company) has the same meaning under Chapters 1 and 14A. (d) excluded from being treated as a member of the public under Rule 8.24, merely by reason of the fact that it is holding shares of an issuer as depositary for the benefit of depositary receipt holders Currently, the exemption applies throughout the Listing Rules. To avoid any ambiguity, we propose to specify that the depositary is not regarded as an associate defined in Chapter 1 or Chapter 14A. R21.04(3)(a) An investment company will not on its own or in conjunction with any connected person take control of underlying investments Rule 21.04(3)(a) is to ensure that assets are held by an investment company for investment purposes. It should cover the extended connected persons under Chapter 14A (i.e. the investment manager, investment adviser and custodian and their connected persons). R21.04(4) At the time of new listing of an investment company, no person shall control 30% or more of the votes exercisable at any general meeting of the company. The interests of all the associates of a shareholder and any persons acting in concert with the shareholder will be aggregated For any individual, Chapter 14A extends the definition of associate to an individual's family members and companies controlled by them. To determine whether a person can control the investment company, the extended associates' shareholdings should also be taken into account given their relationship with the person. The public float requirements are to ensure a minimum level of securities for trading to facilitate an open and orderly market for the investing public. R10.03 A new applicant's directors and their associates may only subscribe for or purchase any securities for which listing is sought if the conditions set out in Rule 10.03 are met The restrictions are to ensure that any purchase or subscription of securities by the new applicant's directors, existing shareholders, or persons related to them, are not made on a preferential basis and the minimum public float can be met. The Rule is to avoid abuse of confidential information regarding the status or developments of the listing application by connected persons. PN4 - Para 4(d) For a proposal to issue new warrants to existing warrant holders or to change the exercise period or exercise price of existing warrants, the circular must contain details of any dealings by the issuer, and where relevant, the manager of the issue of new warrants, or any of their associates and any dealings by any connected persons of the issuer in the existing warrants in the period commencing 3 months before the announcement of the warrant proposal The Rule is to ensure transparency in any recent dealings in the existing warrants by persons who may influence the terms of the proposal. App1A - Para 27A, App1E - Para 27A A new applicant's listing document must contain a statement explaining how it is satisfied that it is capable of carrying on its business independent of the controlling shareholder (including any associate thereof) after listing Rule 8.10 requires an issuer to disclose any competing businesses of its controlling shareholder and directors at the time of new listing, and to continue to disclose its directors' competing businesses in subsequent annual reports. The issuer must also disclose how it is capable of carrying its business independent of the competing businesses. App 1A/IE - Para 27A and Rule 14A.66(8) extend the scope of Rule 8.10 to persons associated with the controlling shareholder and directors. App10 - R4 If a director is a sole trustee, the model code will apply to all dealings of the trust as if he were dealing on his own account unless the director is a bare trustee and neither he nor any of his associates is a beneficiary of the trust The Model Code is to ensure that directors do not abuse, and do not place themselves under suspicion of abusing, inside information that they may be thought to have, especially in periods prior to the issuer's results announcements. The Code specifies that the dealing restrictions equally apply to any dealings by the director's spouse or any minor child, and any other dealings in which the director is treated as interested under Part XV of the Securities and Futures Ordinance. App 10 - R4 and R5 set out the circumstances where dealings by a director in his capacity as a trustee will be exempt. The definition of associate under Chapter 1 (which covers the director's spouse and their children under the age of 18, but not other family members) is in closer alignment with the scope of persons regarded as closely associated with the director for the purpose of the Model Code and Part XV of the Securities and Futures Ordinance. App13B (S1) - Para 5 An issuer's articles of association shall restrict the making of loans to directors and their associates and shall import provisions at least equivalent to the provision of Hong Kong law App13B(S1) - Para 5 is one of the Rules to ensure overseas issuers' constitutional documents to provide shareholder protection to standards similar to those provided by Hong Kong law. Issuers comply with the Rule as long as their constitutional documents contain provisions governing loans and similar transactions with directors and persons connected with them at least equivalent to the provisions of Hong Kong law. any associate of any controlling shareholder of (i) the IFA or (ii) any holding company of the IFA. The Rules set out the scope of persons treated as members of an IFA group, and the persons treated as associated with the directors or employees of the IFA group. The Rules set out the scope of persons treated as members of a sponsor group, and the persons treated as associated with the directors or employees of the sponsor group.